Sold out of Package Bees for 2019. Thank you! We are looking at late April early May still. We will call you when they arrive to schedule your pick up time. Lotions and Potions made by Master Beekeeper Carol Cottrill. She is teaching how to make these products in the class listed above. 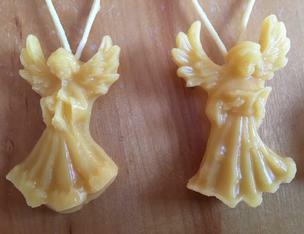 Wax angel ornaments by Chris Rogers. You can learn how to make these with Carol and other fun wax candles in the Wax Class.